“Blissful, a wonderful ending to a long day. 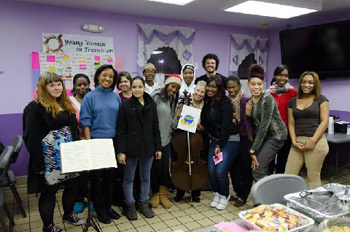 "Music feeds our soul and I'd wish that there would be many more places like Music Kitchen where musicians can offer their art to people in need of comfort and encouragement and, in return, get a unique feeling of what it means to share the sensation of music. The intense interaction of giving and receiving has been a very special experience for me and has moved me deeply." Welcome to the Music Kitchen Website! 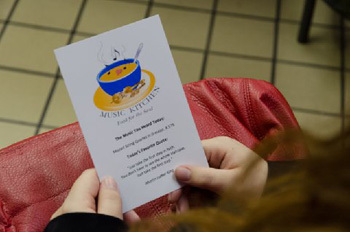 Music Kitchen in The New York Times: "For the Homeless, Music that Fills a Void"
Food for the Soul: A write up in Strings Magazine about Music Kitchen. 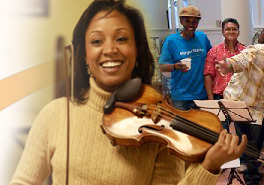 Music Kitchen Founder, Kelly Hall-Tompkins, appears on New Morning TV with Timberly Whitfield. 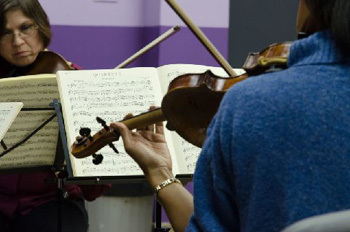 The segment features an interview with Ms. Hall-Tompkins as well as a performance of the Mozart Duo for Violin & Viola K.423 with Ms. Hall-Tompkins and Orlando Wells. Jazz Singer Rene Marie Performs June 2 at the Olivieri Center, featuring her new song about homelessness in America, "This is Not a Protest Song"
© 2006-2007 Music Kitchen. All rights reserved. I am very pleased to announce that Glenn Dicterow, concertmaster of the New York Philharmonic, joins Music Kitchen as a donor this season and as an artist beginning in the 2014-2015 season. Glenn Dicterow is one of the world's greatest concertmasters and, as the youngest concertmaster hired in the New York Philharmonic's 171 Year history, has served for 34 seasons. 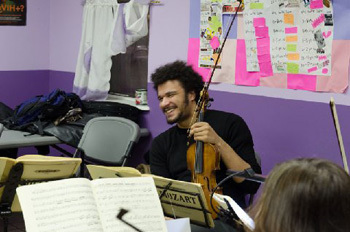 He has been featured soloist with the orchestra over 200 times, performing much of the major solo violin repertoire. Glenn also helped to launch the Bernstein Serenade into the violin canon as featured soloist of the work in a tour of major American cities in 1986 with Leonard Bernstein conducting. Glenn Dicterow has recorded for BMG and EMI and is a Bronze Medalist in the Tchaikovsky International Violin Competition, among numerous other prizes. Ferocious technical chops? Yes, to spare. In the music field today there are a lot of instrumentalists with strong technique. What is far less common and a hallmark of Glenn's polished performance is the grace, finesse, musical insight and artistry which he possesses. He is also known as a gentleman and a diplomat on the stage by his colleagues, audiences and the conductors with whom he has worked. 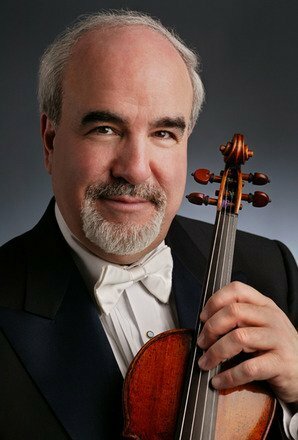 Alongside his orchestral and solo career, Glenn Dicterow has also enjoyed a robust chamber music presence through his Lyric Piano Quartet with his wife, violist Karen Dreyfus, the Amerigo Piano Trio and now with the newly formed Dicterow deMaine Biegel Piano Trio (Glenn Dicterow, Robert deMaine, cello, Jeffrey Biegel, piano). Glenn Dicterow has announced his retirement from the New York Philharmonic at the conclusion of this season. His shoes will be very hard to fill indeed. But he is quick to assure that for him this is merely a change in direction, not a time for slowing down in the slightest. I have been attending many of his numerous features leading to the conclusion of the Philharmonic season and it is clear that Glenn Dicterow is at the height of his musical gifts. Glenn is interested to now devote more time to using his music to uplift the community and has already demonstrated that he is passionately committed to Music Kitchen's mission. He writes, "I truly believe in what you are doing and know that it will ultimately make a difference in our very troubled world." I am a proud former student of Glenn Dicterow, during my Master’s Degree at the Manhattan School of Music, and I am honored to welcome him to Music Kitchen- Food for the Soul concert series. Please stay tuned in early 2014 to hear more from Glenn Dicterow as well as more details about this exciting collaboration. 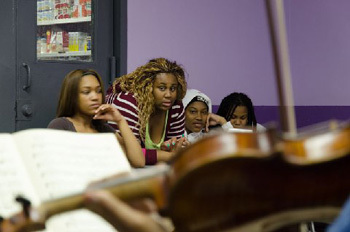 I urge you to be a part of this exciting new chapter of Music Kitchen and become a donor today!